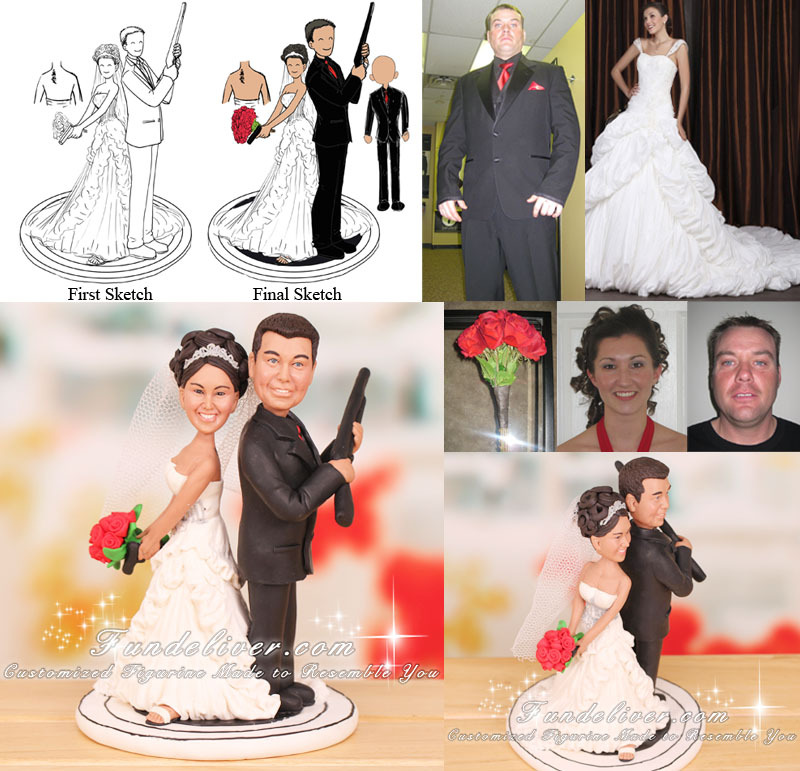 This is a completely customized back to back bride and groom carrying handgun and shotgun wedding cake topper ordered by one of our customers. 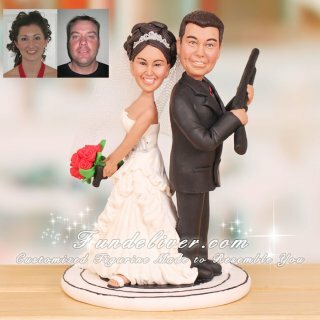 They would like the bride and groom figurine to be back to back with smiles or smirks on their faces. The bride is wearing modern strapless wedding dress with a straight across neckline, holding a handgun in her left hand and a bouquet of red roses in her right hand, kinda like being held together positioned on the train of her dress. Also she would like to see the tip of her shoes showed from the bottom of her dress. The groom is wearing a black tux with red tie, holding a shotgun. His pants are less fitted more of a straight leg (his pants are never smaller than a straight leg because his calves are too big). They would like the topper to be a realistic size with no bobble-head going on, which lead to extra $100 added. Usually we charge $288 for a couple figurine with big heads, sort of bobble head effect. But if you want a realistic size figurine without bobble-head effect, we must make the heads smaller. However the difficulty level will rise greatly to keep the same likeness. That is why there will be extra $100 added for a coupe figurine ($50 added for an individual figurine).